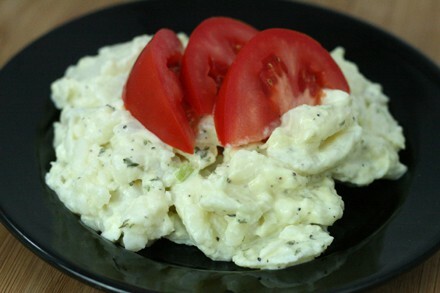 There are so many different styles of the beloved potato salad recipe. Most common are German, red potato and mom’s classic potato salad. This recipe is a little different. What makes it French style is the Dijon mustard, the dry white wine and of course, the tarragon (vinegar and herb itself). Tarragon is an integral player of French Cuisine. It’s unmistakable anise-like aroma and flavor is so desirable in French cooking, from the professional chefs, who are truly artists, to the rustic kitchens of the countryside. 1. Heat 1-inch salted water (1/2 teaspoon salt to 1 cup water) to boiling. Add potatoes. Heat to boiling. Reduce heat. Cover and cook until tender, 30 to 35 minutes. Drain, cool and peel. 2. Rub 2- quart bowl with garlic. Discard garlic. Cut potatoes into 1/4-inch slices and place in bowl. 3. Dissolve bouillon in hot water. Add wine. 4. Pour over potatoes. Cover and refrigerate, stirring once or twice. Drain. 1. Shake all ingredients in tightly covered jar and gently toss with potatoes. Sprinkle with parsley. Garnish with tomato wedges if desired.